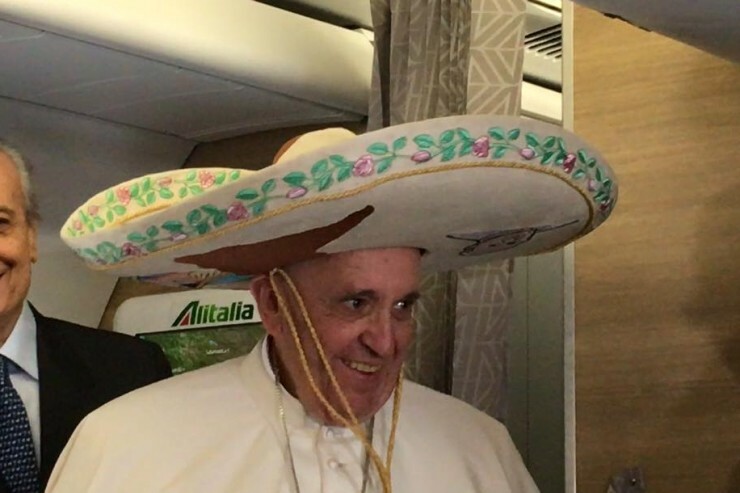 Pope Francis hasn’t even arrived in Mexico, but already has been sporting a sombrero on the papal flight, so he ‘can start to feel Mexican,’ like his predecessors. Mexican journalist Valentina Alazraki of “Televise,” the dean of the Holy See Press Corps, gave the first Pope from the Americas the gift to celebrate his visit to her homeland. The sombrero, she told him, is “so you feel Mexican!” Speaking on her tradition of gifting sombreros to Popes, she noted she first gave one to John Paul II 37 years ago. Since he traveled five times to the country, she said he eventually had a collection. The Holy Father expressed his joy to embark on this journey, as he greeted the journalists with him on the papal flight as he headed toward Havana, for the brief meeting with Russian Orthodox Patriarch Kirill, before kicking off his Apostolic Visit to Mexico, Feb. 12 -18. He also reminded the journalist that this will be the last Apostolic Trip of the coordinator of papal visits, Alberto Gasparri. The Holy Father thanked him for his 47 years of service to the Vatican and told the press to anticipate a party to celebrate this on the flight back to Rome. According to Vatican Radio, the Argentine Pontiff responded to press reports regarding a papal visit to Colombia, saying that if peace talks between the government and the Revolutionary Armed Forces of Colombia continue to move ahead, he could visit the country in 2017.